I made this card about a month ago for a WOW card swap. We made it in my stamp club this month. A month had gone by since I made the card so I had to remember how to make it again. Do you ever do that? Fortunately, there is a step-by-step tutorial on Splitcoaststampers.com here. It's called a Center Step card. It not is as hard as it looks. Give it a try! The stamp set used on this set is a Sale-a-bration stamp called, You're Lovely. It coordinates with the Deco Labels framelits. I also used the Sale-a-bration designer paper called, Sweet Sorbet, and the Sale-a-bration embossing folder called Decorative Dots. I also used the new Tag punch from the Occasions catalog, and a favorite embosslit called Beautiful Butterflies. You can earn Sale-a-bration products for FREE for every $50 in purchases during this promotion that runs through March 31. You can place an order on my online ordering website. Even though I have much to do I'm enjoying a lazy Saturday morning. You have to do that sometimes, right? I hope you have a fabulous weekend! This lovely card was made with a bunch of Sale-a-bration products. 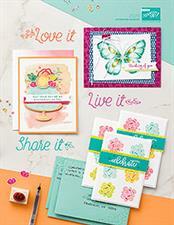 The designer paper, Sweet Sorbet, stamp set, You're Lovely, and the embossing folder, decorative dots are all products you can get for FREE with every $50 in purchases during Sale-a-bration. The image is stamped on whisper white card stock and punched out with the 1 3/4" circle punch and stamped again on calypso coral cardstock and diecut with the labels framelit. You can purchase product on my online ordering website. Click on Shop Now. To view the Sale-a-bration catalog online click here or go the sidebar of my blog and click on the picture of the catalog. Sale-a-bration runs through March 31. TODAY IS THE START OF SALE-A-BRATION!!! What is Sale-a-bration? Stampin' Up! 's biggest promotion of the year! It offers ways for you to earn free products through shopping, hosting a party, or joining Stampin' Up! It's also a time where demonstrators can earn free products based on your sales and recruiting efforts so everybody wins! 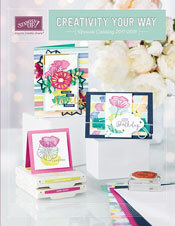 You can earn FREE exclusive product from the Sale-a-bration catalog for every $50 you purchase. Hostesses can earn a bonus $30 in FREE product if their party sales are $300 or more. You can sign up as a demonstrator during Sale-a-bration and get the Starter kit for only $99. You can select $150 worth of product for only $99! Earn 20 percent off your product(or more!) as a demonstrator, earn hostess benefits, and so much more! To make a purchase go to my website and click on the shop now button. Be sure to make a selection of your FREE products if your purchase is $50 or more. To sign up as a demonstrator go to my website and click on Join the Fun. Follow the steps and soon your starter kit will be on it's way! To see the Sale-a-bration catalog just click on the picture of it on my sidebar of my blog. Sale-a-bration runs from now through March 31. Here is another little sneak peek at some Sale-a-bration product. The embossing folder, designer paper, and stamp set are all product you can get for FREE with $50 purchase during Sale-a-bration. Sale-a-bration runs January 28-March 31. I will post the catalog on the sidebar of my website when it goes live on January 28. I had a couple of my nieces over tonight. They are 6 and 8 years old. They brought over these barbie-ish dolls called Monster High dolls. They are all about these dolls and their paraphernalia. It was fun to be around young kids where these little toys make them happy. My teenage boys are all about the expensive electronic toys. Gone are the days of actual toys. I lamented those days when their mess was everywhere in the house but now I kind of miss those days. As for me, my stamping toys make me happy. Being creative and making something pretty in my craft room is very satisfying. I hope you enjoy the fruits of my labor.